As an affluent name in this domain, we hold expertise in providing high quality Marine Hydraulic Pump. A centrifugal pump is a machine that uses rotation to impart velocity to a liquid, it then converts that velocity into flow.Centrifugal type pumps are widely used in the sea water, fresh water system in ships. 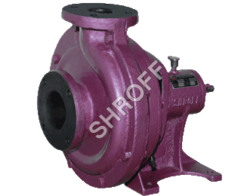 Our organization providing a wide array of Marine Sea Water Pumps to the customers. We offer these pumps in various models like shinko, teikoku, naniwa, heishine, hamworthy, thune europa, KSB of different specifications to meet the variegated demands of our valuable patrons. These are over hauled by our quality controllers before the delivery. Sea water transfering pumps high discharge sales and services.